Cloud Ecommerce - Dedicated Ecommerce Hosting & Shopping Cart | Miva, Inc. Dynamic, virtualized, precision-tuned cloud hosting devoted exclusively to supporting your Miva Merchant store. Build your future atop Miva's world class architecture. Fully owned and managed; from storage to computing resources to networking. Hardware nodes in our VMware cluster automatically reboot, in the case of failure, to operational hardware, while partitioned EMC storage arrays preserve the integrity of your data. Additional server resources (storage, processor power, memory) can be added to your environment in less than 60 seconds. Total server capacity: 256 GB of memory and 40 processor cores. Miva ensures your ecommerce solution stays online with redundant power, storage, paths, and network connectivity. Network connectivity is managed in-house with several 10-gigabit connections to multiple providers, redundant border routers, and redundant core routers. This ensures provider failure, link failure, or hardware failure do not result in loss of connectivity. We also fully support IPv6 on all hosted services. Failed physical servers automatically reboot on operational hardware, while independently operating, highly redundant disk storage ensures your data continuity. Servers are "live migrated" without outage. When hardware is taken offline to perform maintenance, servers don't need to reboot. vSphere replicates server activity, switching to the new underlying hardware as the "live" copy of the previous server. 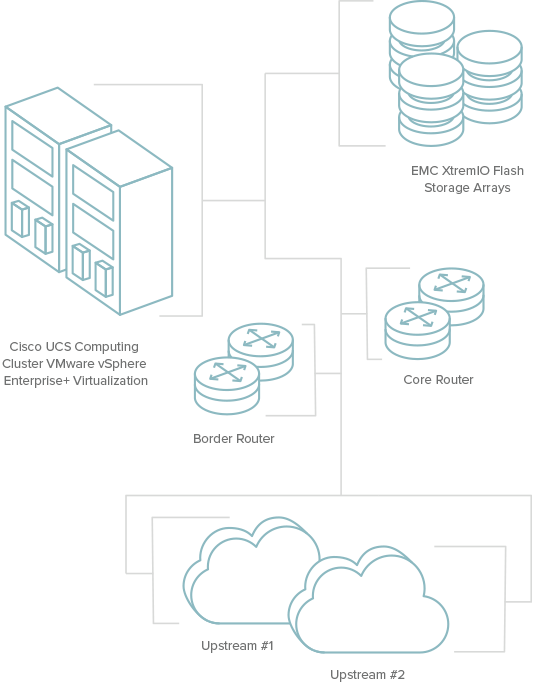 Server storage on EMC arrays consisting of hundreds of drives in an AFA (All Flash Array) make for the highest performance possible – 30-40 times that of a traditional system. Redundant storage processors and network paths guarantee zero downtime maintenance. Day or night, 24/7/365, our in-house experts ensure your maximum uptime. We came to Miva because our business had become too big to leave in the hands of people that don't understand the role their platform plays in the livelihoods of their customers. Looking to mitigate that risk, we were pointed to Miva. We owe your recommender a huge thanks. We couldn't have chosen better. State-of-the-art and expertly managed, Miva's dedicated hosting environment offers premium performance and uptime – easily scalable to meet the highest traffic demands.